One of Canada’s most respected and prolific craft breweries to pop up in the last decade – Bellwoods continues to impress and amaze anyone who can get their hands on a bottle. It is next to impossible to buy bottles this side of Ontario, you’ll see some kegs at good beer bars from time to time but bottles are few and far between – luckily you’ve got Bishops Cellar! As years passed and the brewery’s oak aged beer became more robust, they discovered many unique, interesting, single barrels deserving of a special release. 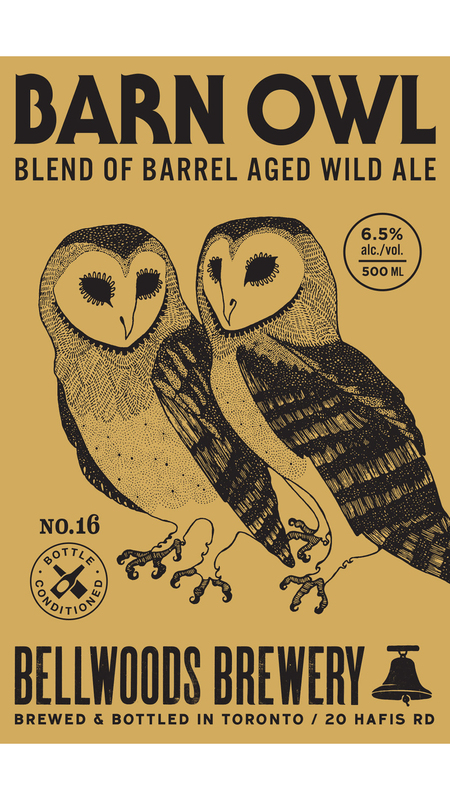 Barn Owl was created as a response to these lone wolves, and has grown into a diverse, ongoing series that reflects the growing diversity of their barrel program. The name is a nod to the wise and exacting animal that keeps watch over the farmhouse (er..industrial warehouse), and the one-off creations are released sporadically throughout the year, just as soon as they deem the barrels ripe for the picking. What it tastes like, what it smells like: Bold, up-front aromas and flavours of dried rose petals, meyer lemon and oak. Nuanced brett characteristics and wild yeast derived flavours play a supporting role, with solid bottle-conditioned carbonation, and a lively body. Delicious, fancy, and so worth enjoying.